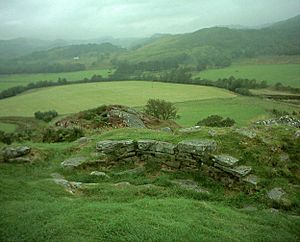 A hill fort is an ancient fortified refuge or defended settlement. It was usually in a place that rises from the surrounding area, given the name. This is done to exploit the rise for military advantage. The fortification usually follows the shape of the hill. Usually it is made of one or more lines of earthworks. 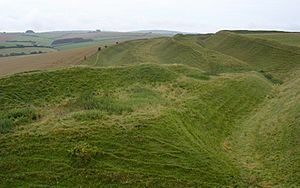 There may also be stockades or defensive walls, and external ditches.Maiden Castle in Dorset is the largest of around 1000 hill forts built in Britain in the Iron Age. In a hill fort, the entrance through the inner ramparts had massive timber gates. The inner rampart was 14m high and topped by a fence of huge, upright timbers. It was faced with big, limestone blocks. There are many different kinds of hill forts, they were very common. In Europe, the Celts used them for a very long time. 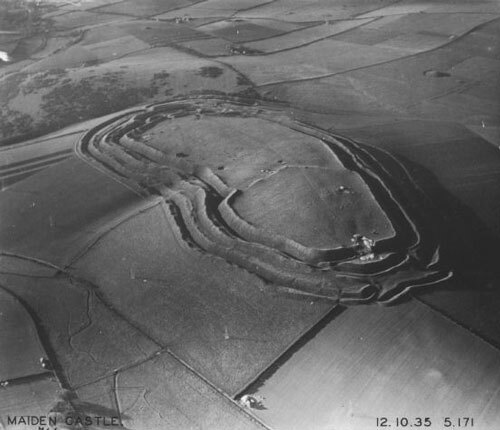 Maiden Castle in England is one of the largest hill forts in Europe. Photograph taken in 1935 by Major George Allen (1891–1940). Hill fort Kostolec, Piešťany (Slovakia). Hill fort Facts for Kids. Kiddle Encyclopedia.